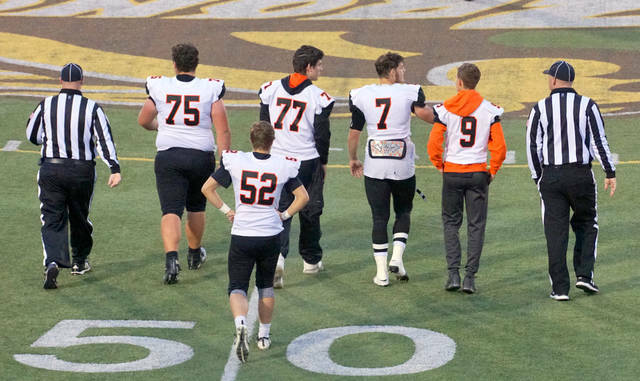 Wilmington High School fooball captains Alex Flanigan (75), Justus Farris (77), TJ Rockhold (7), Mason McIntosh (9) and Austin Brummett (52) walking out for the coin flip prior to Friday night’s game with Western Brown. NOTE: Clinton-Massie has won the last four meetings. Wilmington’s last win over Clinton-Massie came in 1976. MT. 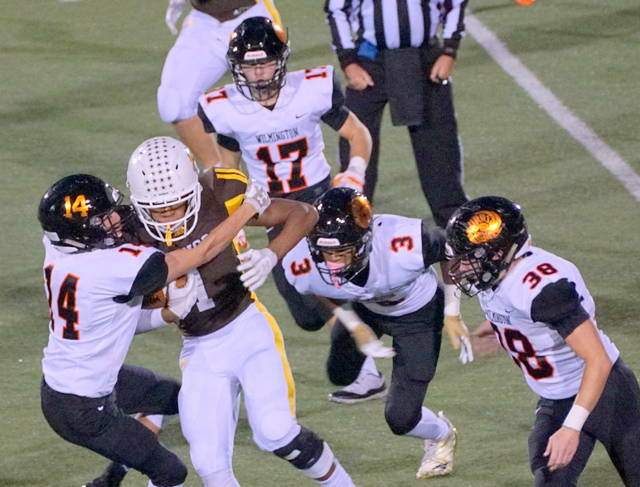 ORAB – On a breezy, chilly, rainy night, the Wilmington High School defense turned back the SBAAC’s best offensive player down the stretch for a 38-37 win. 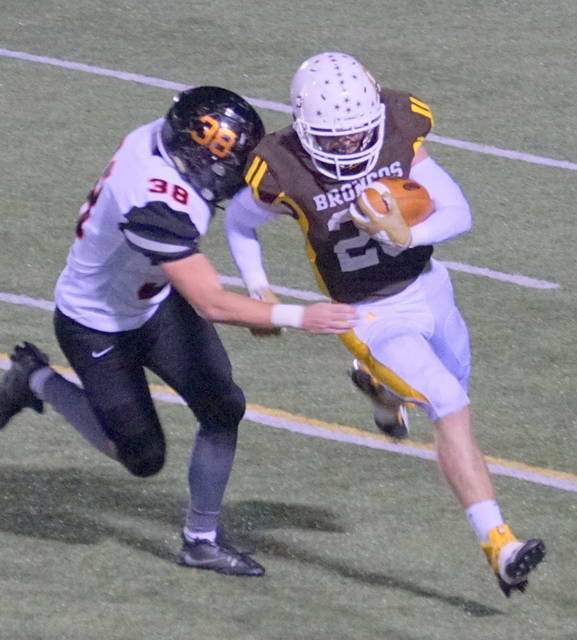 Western Brown’s Josh Taylor passed for three scores and ran for two more but on the final two offensive drives of the game the talented senior quarterback couldn’t overcome the young but growing WHS defense. Chris Custis and TJ Rockhold teamed up for a quarterback that ended any chances of the Broncos winning the game. 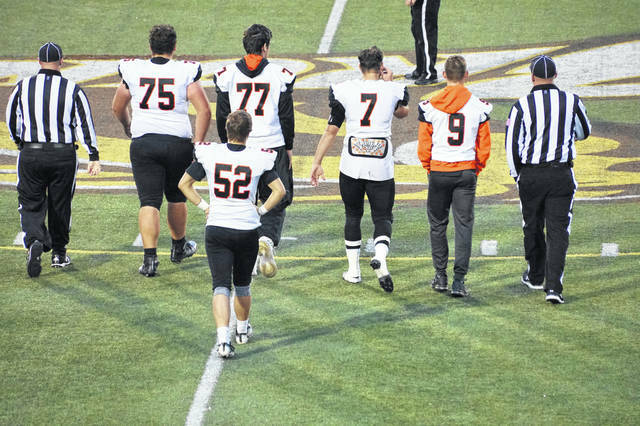 Down 37-24, Wilmington rallied behind its defense and some nifty runs by Grant Mayer, Willie Morris and Brady Evans to move its record to 4-5 overall and 1-3 in the American Division. Western Brown drops to 3-6, 1-3. 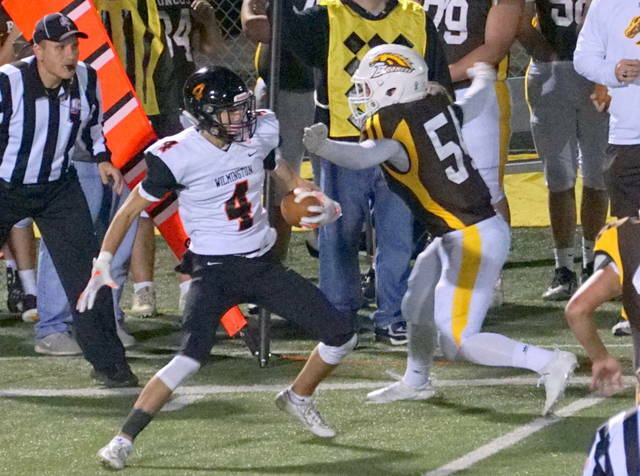 While it wasn’t quite the same scoreboard turning spectacle as last week’s 64-49 Batavia win over Wilmington, the game was a showdown of the top two passing quarterbacks in the SBAAC – Evans and Taylor – but both showed their ability to run with the football as well. 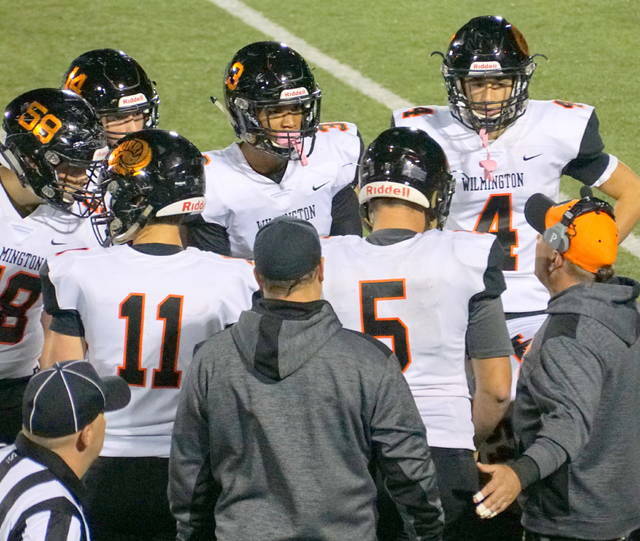 Despite limping on several occasions, Evans had two passing and two rushing touchdowns and directed a balanced WHS attack – 239 yards passing and 175 yards on the ground. Both teams run out of the shotgun formation and get to the line ready to play. Wilmington used several defenders, looking to keep players fresh while chasing Taylor. In the end it paid off. The Broncos and Hurricane had numerous successful running plays to keep the defenses honest. Morris and Mayer showed off their fancy footwork. Cam Coomer and Custis were the primary pass catchers. Coomer scored the first touchdown of the game on a nifty play of 62 yards. After catching a short pass, Coomer slipped a couple tackles then tight-roped his way down the sideline in front of the WB bench ahead of the defense. After Taylor and Co. answered, Evans running and Brady Henry’s kicking made it 14-7 early in the second. Taylor scored on two long runs, sandwiched around a Henry field goal and the Broncos took a 19-17 lead into the halftime locker-room. Coomer scored first in the third then Williams scored as the game went back and forth. 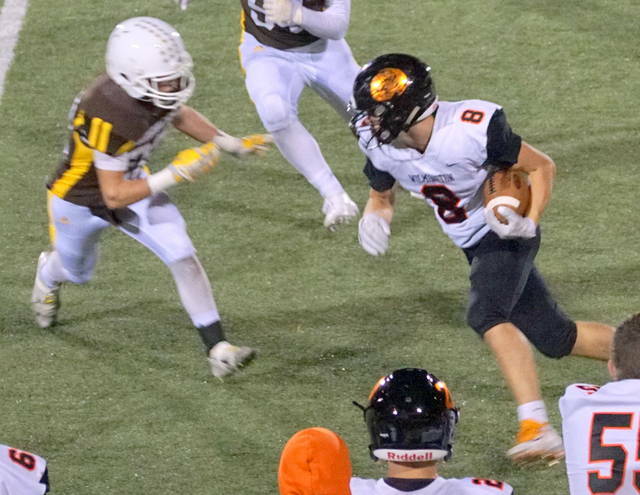 Mayer had several big runs on the WHS scoring drive. On the next WB drive, Bradley Sturgill had a huge sack to force fourth down but Taylor converted on the next play. 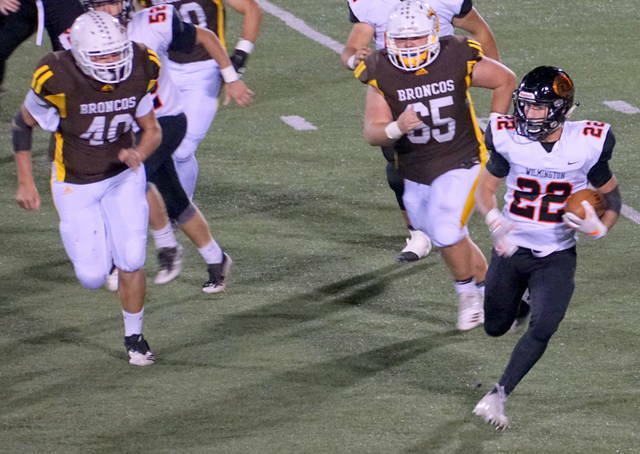 Western Brown tackled WHS punter Rory Bell in the end zone following a botched snap, 29-24. On the ensuing drive, Isaiah Rigling batted away a Taylor pass to force a punt. Later in the fourth, Logan Frazier had a nice breakup on a Taylor pass. But eventually Taylor found his mark when Liam Keller broke open across the middle for six. A Taylor to Williams pass on the two-point conversion made it 37-24 and WHS was down. “I had my doubts,” Killen said. The Hurricane, though, was not done. 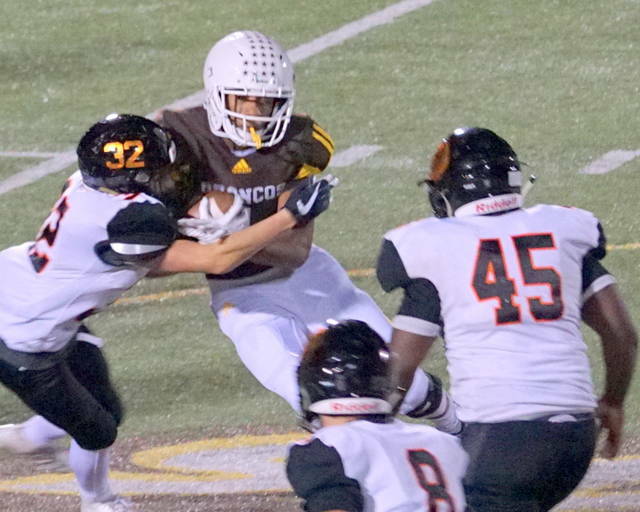 Mayer capped a long drive with a 43-yard tackle breaking run. With the Henry extra point, it was 37-31 Broncos. The WHS sidelines exploded when WB fumbled on the ensuing kickoff but the Broncos recovered. The Wilmington defense stiffened on the next drive and forced a punt, a short punt as it turned out. It went out of bounds at the WB 35. WHS still had 4:01 on the clock. “They were very good about making the adjusments,” Killen said. “They were good about relaxing and just doing their jobs. Morris, who replaced a hobbled Mayer on the drive, ripped off 14 yards then three more to the 17. Evans to Custis put the ball at the 10 and made it third and short. Morris picked up the first down and more to the WB 1. Evans then backed his way to paydirt to tie the game. The all important extra point to break the tie came in the wind and rain. Holder Ryan Camp and Henry made it look like a warm day in August as the kicked sailed through the uprights to put WHS up 38-37. On the next drive, Western Brown moved near midfield before Custis and Rockhold had a Taylor sandwich on third down then Coomer broke up a fourth down pass to clinch it.